For roughly fifty percent of US citizens, getting an annual flu shot is a normal yearly event. However, for the other half of the population, there are numerous reasons why they hesitate before getting one or resist it completely. Below, we list common myths about the flu vaccine and will address the facts for each one of them. According to the Centers for Disease Control (CDC), the flu was responsible for a record-breaking 900,000 hospitalizations and over 80,000 deaths in the 2017-2018 winter season1. The strain of influenza A — H3N2 — is a particularly harmful strain that caused many patients to develop secondary infections such as pneumonia and systemic organ failure2. For more information and to locate the closest vaccination options, visit CDC Flu Resources. Myth #1: "There's No Point If You Can Still Get The Flu." Many resist getting a flu vaccine because there is a still a chance that they could contract the virus. However, multiple published articles demonstrate that the flu shot can prevent the virus from making the body susceptible to more harmful secondary infections. Getting a flu shot also lessens the risk of hospitalization and admission to the intensive care unit (ICU) once contracting the virus3,4. Another common reason to not get the flu shot is that it can cause you to become sick with the flu after vaccination. While some do experience fever and chills after being vaccinated, this is due to the body's immune response rather than the infection itself. Upon addition of a foreign substance into the body, the immune system initiates a response that generates inflammation and antibodies. This response is the same response that the immune system will launch if one contracts the virus. However, by using modified versions of the virus, the immune system is able to generate antibodies to the infection without experiencing the negative symptoms of the flu. Myth #2: "Vaccines Increase Autism Risk." The CDC had published extensive data and information in order to debunk this myth5. A study published in 2011 by the Institute of Medicine (IOM) reported that eight vaccines given to children do not cause any of the autism spectrum disorders (ASD) and are in fact, very safe6. A CDC study two years later added additional research showing that there is no connection between receiving a vaccination and developing ASD. The study specifically analyzed the antigens present in vaccinated children with and without ASD, and concluded that the levels were equal amongst both groups7. Myth #3: "Young, Healthy, and Immuno-Competent People Don't Need Flu Shots." The last reason we'll discuss is most common in college students and young to middle-aged people. This group has been shown to have low rates of vaccination due to their age and overall good health. However, a recent report by National Public Radio (NPR) titled "Last Year, The Flu Put Him In A Coma. This Year He's Getting The Shot" highlights a very traumatic experience for one 38-year old man who did not receive a flu shot. Both he and his wife came down with flu-like symptoms in January 2018. When her fever and symptoms started subsiding, his condition was rapidly declining. They were encouraged to go to the emergency room when his heart rate had increased and blood pressure dropped significantly. Once admitted, it was determined that he was experiencing sepsis — a life-threatening condition that causes widespread organ failure. He was put into a medically-induced coma for one week while doctors treated him with antibiotics. His treatment was not guaranteed to work depending on how advanced his sepsis had become, so family members were encouraged to visit and say their goodbyes. After an astonishing fifty-eight days in the hospital, he was released into a nursing home for three weeks of rehabilitation8. The patient mentioned in this article would like to spread the message: get your flu shot. 1. National Foundation for Infectious Diseases. Influenza and pneumococcal disease can be serious, health officials urge vaccination. (2018). 2. Allen, J. D. & Ross, T. M. H3N2 Influenza Viruses in Humans: Viral Mechanisms, Evolution, and Evaluation. Hum. Vaccin. Immunother. 0, 00-00 (2018). 3. Arriola, C. et al. Influenza Vaccination Modifies Disease Severity Among Community-dwelling Adults Hospitalized With Influenza. Clin. Infect. Dis. 65, 1289-1297 (2017). 4. Thompson, M. G. et al. Influenza vaccine effectiveness in preventing influenza-associated intensive care admissions and attenuating severe disease among adults in New Zealand 2012-2015. Vaccine 36, 5916-5925 (2018). 5. CDC. Vaccines Do Not Cause Autism. CDC. Accessed: 11th January 2019. 6. Adverse Effects of Vaccines: Evidence and Causality. (2011). 7. 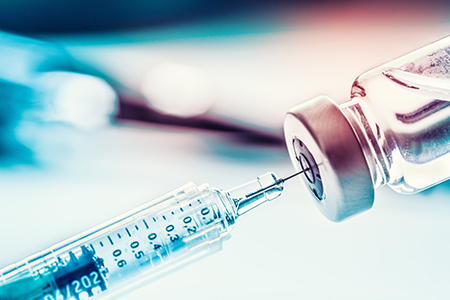 Destefano, F., Price, C. S. & Weintraub, E. S. Increasing exposure to antibody-stimulating proteins and polysaccharides in vaccines is not associated with risk of autism. Pediatr. Pol. 89, T31-T38 (2014). 8. Bram Sable-Smith. Last Year, The Flu Put Him In A Coma. This Year He's Getting The Shot. National Public Radio (2018).